Are you looking for a vegan chain wallet? Then you've come to the right place. We've found 7 good looking options made of faux leather or other materials with a chain to ensure you don't leave it behind. Don't ever worry about organization again. 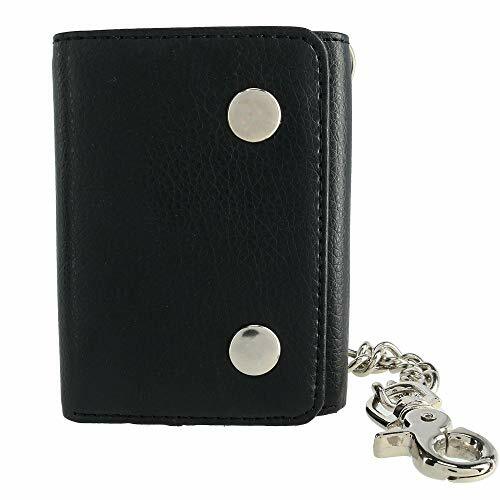 This faux leather trifold biker wallet in black has an ID window, 14 card slots, three bill compartments, a secure coin change pocket and a hidden pocket for receipts and smaller items. Comes with a 16-inch silver chain. Closes with two metal snaps. Advertised as vegan: No, but it's advertised as faux leather. Pros: You'd be amazed at how well your cash, receipts and cards fit into your wallet when they're all tucked away in an orderly fashion. This biker wallet is cool, super functional and vegan leather jacket-ready. Cons: Some reviewers mention that the chain isn't heavy-duty. Bold and elegant, this women's red vegan leather wallet is softly textured with contrasting beige lining for a chic touch. Constructed with a clear ID pocket, multiple card slots and a cash compartment. Cellphone pocket can hold most smaller to standard size smartphones. Silver chain wrist strap is removable. Pros: This wallet looks fancy but it's a steal. There are lots of little spots to stow away money, receipts, notes and whatever small items you like to keep nearby. Cons: If you're into this wallet for the cellphone carrying capacity, it probably won't hold a phone on the larger size, so make sure to check measurements. Men, women, kids and teens can all use this down-to-earth trifold wallet from Hempy's. Made from all-natural hemp, it's durable, flexible and eco-friendly. Comes with a brassy wallet chain. Organized with card and bill sections plus a zippered coin pouch. Pros: It's a neat alternative to faux leather chain wallets. Though it's laid-back and wearable with anything from jeans to cargo pants, it offers something new and different. Buy it if you're looking for a wallet that feels light and comfortable in your pocket. Cons: It could be too casual for some. This men's wallet has a nice crackled appearance that complements the matte black vegan leather. 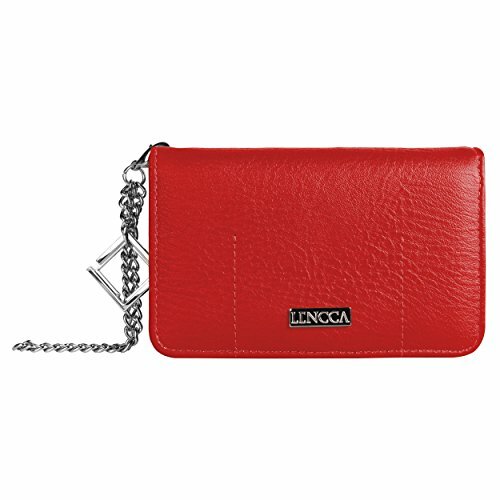 Features a double snap closure to protect three card slots, a separate ID compartment and a zip coin pocket. Made with a 16-inch lobster claw silver chain. 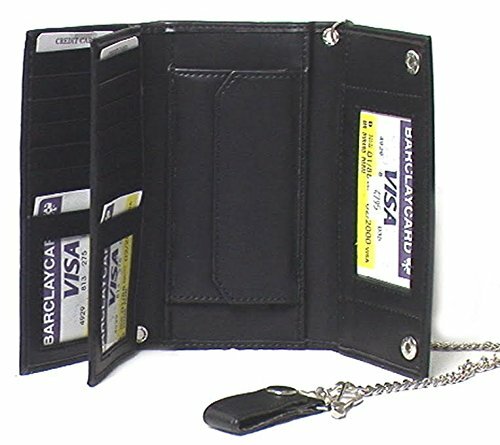 Pros: For an inexpensive wallet, this biker-style chain wallet is pretty well-organized. The zippered coin pouch can really come in handy when you run into coin-fed parking meters. Cons: There are limited card slots. Sometimes the lightweight chain that came with the wallet you bought just isn't cutting it. 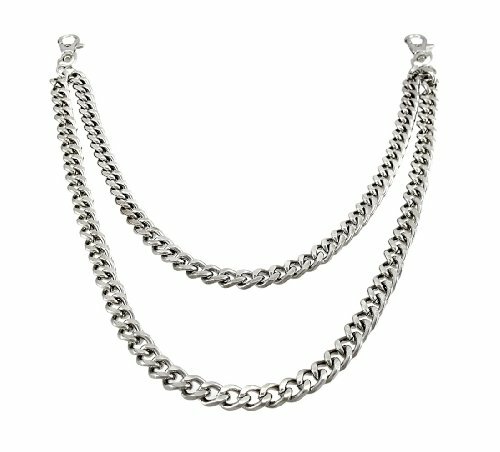 If that's the case, you can switch to this heavyweight, chrome-plated silver chain. Features two stylish metal strands. Attaches with easy-to-use lobster claw clasps. Advertised as vegan: No, but it's made of metal. Pros: What's cooler than a chain wallet? Maybe a double chain wallet. Pair it with black or dark wash jeans. Cons: Heavy chains aren't comfortable for everyone. Men and women might like to swap out their current wallet chains for this fabulous gold-toned chain with chunky links. Fastens with lobster claw clasps. Long and dramatic with a shiny finish. Advertised as vegan: No, but it's a vegan steel chain. Pros: Most wallet chains you come across are your garden variety silver chains, but not this one. It'll add a dressy spin to your look for day or evening wear. Cons: Gold can sometimes be less matchable than silver. Just need a simple silver chain to hook onto your wallet? Check out Asos Design's burnished silver snake chain. Long and slender with fine links. Designed with lobster clasp fastening. Advertised as vegan: No, but it's 100% steel. 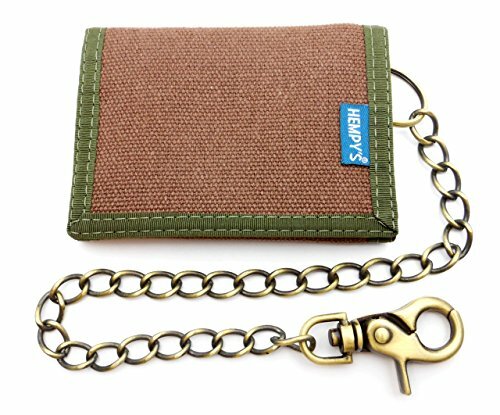 Pros: The refined look of this wallet chain lends subtle edginess to your outfit. Wear it with casual to dress-casual attire. Cons: Depending on what your personal taste and needs are, the fine type of chain may or may not be heavy-duty enough.